Signed lower c., synthetic polymer paint "GINGER. RILEY". Not dated. Hetti perkins, Art + soul: a journey into the world of Aboriginal art , 'Bitter + Sweet', pg. 174-239, Carlton, 2010, 188-189 (colour illus. ), 190, 192, 281. Judith Ryan, Beyond the pale: 2000 Adelaide Biennial of Australian art , 'Ginger Riley', pg. 73-75, North Adelaide, 2000, 74, 75 (colour illus. ), 100. Wayne Tunnicliff, Tradition today: Indigenous art in Australia , 'Ginger Riley Munduwalawala', pg. 94, Sydney, 2004, 94 (colour illus.). Art Gallery of New South Wales annual report 1999 , Sydney, 1999, 18 (colour illus.). City of Sydney Yearbook: 1999 , Sydney, May 2000, 115 (colour illus.). 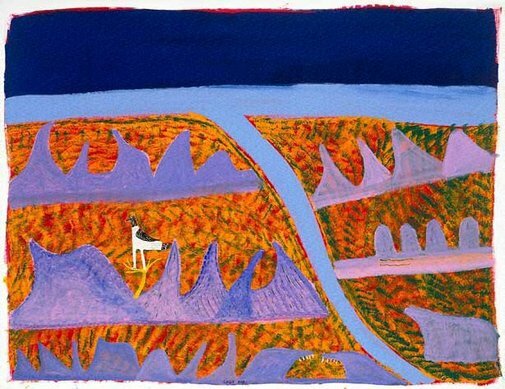 One sun one moon: Aboriginal art in Australia , 'Ginger Riley Munduwalawala in conversation', pg. 145-147, Sydney, 2007, 144 (colour illus. ).